Pacing isn’t important in a sprint. In a 13-year race, it’s everything. Sometimes, even during the search for knowledge, some publishers promote myths. Unsuspecting parents often believe certain ones, thinking, for instance, that “using this company’s textbooks is like a badge of honor—it means my child is advanced!” But very often the “Advanced Curriculum” badge of honor the parent thought they could wear becomes a millstone around the neck of the child. Often parents get test results back which seem to indicate that their child is excelling in remarkable ways. And often that may be true. But test scores can be misleading. And testing terminology even more so. (For instance, a child in 4th grade who is “reading on a 10th grade level” means that child can read 4th grade books as well as a 10th grader could read 4th grade books [with the same level of comprehension, vocabulary skills, etc.]. It doesn’t mean that child can read 10th grade books as well as a 10th grader.) Take a look at “Testing Your Testing Knowledge” to see some of the other basic misconceptions about test scores and see if you really know all you thought you knew about tests. Most parents believe their children are smart, advanced, gifted... you name it. So it comes as a shock to many parents when we tell them that giving their child an “advanced” textbook may actually stunt their intellectual growth. The reason for this is that usually advanced textbooks are simply textbooks for higher grades repackaged as textbooks for lower grades. That means they often contain exercises and information which a child is not developmentally able to process yet. Also, much of the content is critically beyond most students and a teacher faced with forcing students to learn the information will often fall back on simple memorization. Questions and student-teacher interaction are squelched because there is simply no time to stop and comprehend the material. So students memorize large amounts of information which they are unable to critically process because of their developmental stage or because the pace of the textbook demands that information be memorized faster than it can be processed. Very often this leads to negative attitudes toward learning. BJU Press textbooks are written to optimize a child’s comprehension of each subject at each developmental stage—no matter whether he’s an advanced, average, or slower learner. 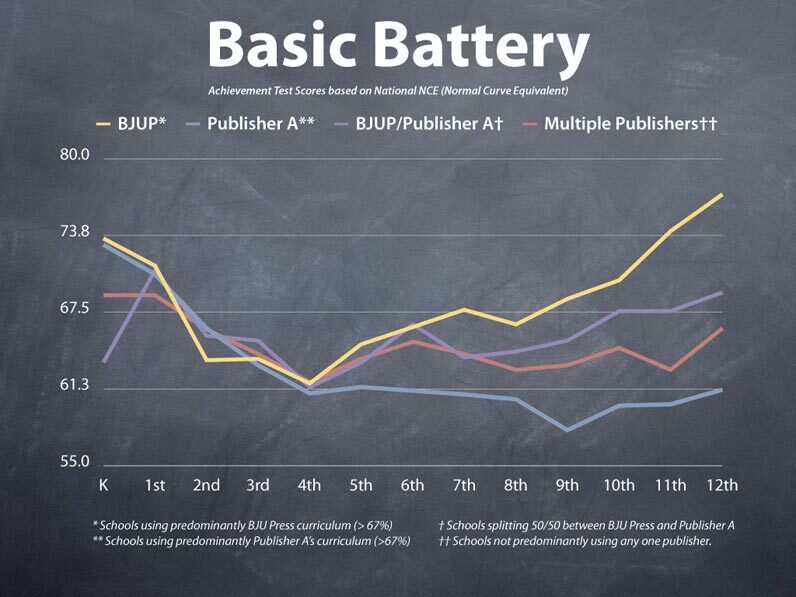 In fact, in a nation-wide study, BJU Press users outperformed all other Christian publishers including those who publish “advanced” textbooks. We think it’s because of the paced learning approach—specifically because the BJU Press advantage appears most strongly over time. While advanced textbook users appear to be doing well in early grades, they’re actually falling behind the pace of BJU Press textbook users because they usually haven’t comprehended what they are memorizing. BJU Press users, however, are taught “line upon line, precept upon precept”—taught to understand a subject at each step—allowing their growth to compound and accelerate in later grades to the point where the difference is very noticeable. or our articles on testing, education, and Christian textbooks.